So the upcoming and latest revision for Dungeons & Dragons are about to hit the market, and I am quite sure that dungeon masters as well as RPG buffs everywhere would be more than pleased to pick it up when it arrives, bringing them through a second childhood in the process. 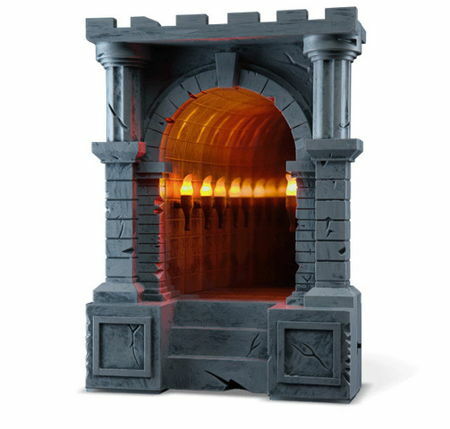 For those who love to LARP, (Live Action Role Play), then you might want to consider adorning the $24.99 Infinite Dungeon Corridor and lead your players to it at some point in the game or another, where this happens to be an optical illusion that shows off a dungeon without end. The illuminated-torch-lined dungeon corridor stretches into infinity, making this exclusive ThinkGeek creation shed a new light take on the classic infinity mirror. It would be the ideal addition to spruce up your home, office or gaming room, or basically anywhere else that needs a little bit of extra “magic”.